GM Dragan Solak has completed the transfer from Serbian Chess Federation to Turkish Chess Federation. Last month he played the 2nd board for Serbia at the European Team Chess Championship but starting with the 41st Rilton Cup he will represent Turkey. The TSF will regulate the transfer fees in order to have Solak in the team for the 2012 Chess Olympiad in Istanbul. With the projected elo of 2613 in the January rating list Solak will be the highest rated player in Turkey. “GM Dragan Solak changed the federation and will represent Turkey. As all know, TSF, has managed to raise 3 new GMs and 2 new WGM in the last three years. Those are GM Haznedaroglu, GM Esen, GM Can, WGM Yildiz, WGM Ozturk. IM Mustafa Yilmaz will be GM very soon. As TSF, we do have a policy not to immigrate foreign players to our federation. However, someone who speaks excellent Turkish, has connection with Turkey, respects flag and national anthem, we may think. Dragan is married with our ex national team member Yildiz, they have a daughter Lara, 3 years old. He speaks excellent Turkish. That is the reason we helped him to change the federation and we know he will be a role model in Turkey. Very soon there will be a few more players joining to TSF with similar basis. “In the past 10 years I have spent as much time in Turkey as I have in Serbia. In this period I have witnessed the incredible development of the Turkish Chess Federation, which has grown to be the best organized chess federation in the World. I have taken part in many events organized by TSF and they were, without exception, organized on top level. That’s why I decided to take this logical step and I am looking forward to representing Turkey during the next year’s Olympiad. 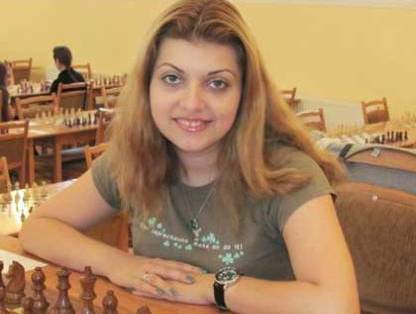 The Armenian Chess Federation announced the transfer of WGM Evgeniya Doluhanova from the Ukrainian Chess Federation. FIDE officially confirmed the transfer on Monday. Doluhanova is winner of a number of international tournaments and the 2009 Ukrainian Woman Champion.